It was July, 1947. Refugees from the Eastern territories were gathering for the first time in Schoenstatt, Germany for religious exercises. It has to do with a day of remembrance and renewal of the Covenant of Love sealed on the 18th of October 1914, by Father Kentenich with the Blessed Virgin Mary in the old Chapel of St. Michael, in the valley of Schoenstatt. 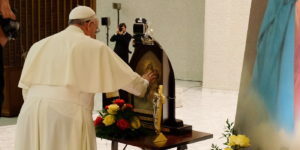 (Something similar to what the 7th of each month is for the devotees of St. Cayetan, or the 13th for those connected to Fatima). A day of remembrance, but, likewise, a day of renewal. Who does not understand that, in this world, all which is not renewed constantly, in time, tends to decay under the influence of an inexorable law of “spiritual gravity?” Every 18th, we want to renew the Covenant of Love which we once sealed with the Blessed Virgin Mary, the Mother Thrice Admirable, Queen and Victress of Schoenstatt. We offer Her all we were able to do during the passed month to her “Treasury of Grace,” and we place into her hands and heart the following month. Upon doing this, Mary also renews the Covenant She has sealed with us, since this covenant has, as we have seen, a mutual and reciprocal character. On that day, the 18th, we try to go on pilgrimage to the Shrine to which we are attached. If we cannot do it physically, we at least try to do it spiritually. In this way we want to advance, on the way of our earthly pilgrimage…..month by month…..year by year. The Covenant of Love we have sealed with the Blessed Virgin Mary should become more and more the fundamental axis of our life.